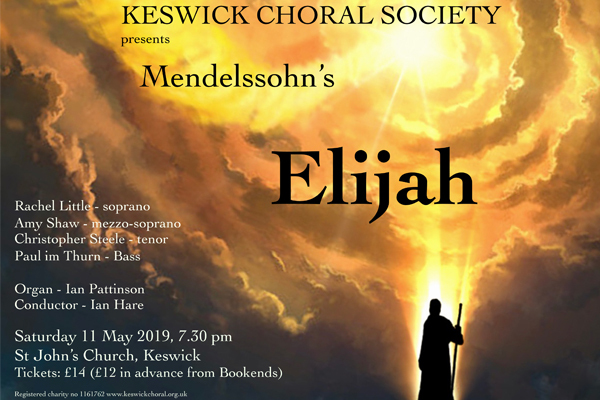 The final performance in Keswick Choral Society’s busy 2018-19 season will be a performance of Mendelssohn’s Elijah, one of the greatest oratorios in the choral repertoire. First performed in 1846 to rapturous acclaim by an audience of 2,000, and then many times over the following hundred years, it fell out of favour after WW2 but in recent years has regained popularity. Rachel Little (soprano) was born in Kendal. She is the Artistic Director of the award-winning Amabile Girls’ Choir and has a successful teaching practice based in her home town. The conductor is the Society’s Director of Music, Ian Hare, who has held organist’s positions at Cartmel Priory, Carlisle Cathedral and Crosthwaite Church, Keswick, and currently St Oswald’s Grasmere. For 25 years he was the Chorus Master of Cumbria Rural Choirs. Ian is an Honorary Fellow of Lancaster University and Cumbria Life Musician of the Year 2017.
an Evensong for Passiontide at St Andrew’s Church, Dacre, including music by Mozart, Mendelssohn and Stanford. The Society is always happy to welcome new members. Those interested in joining an active programme for 2019-2020 should contact us through keswickchorasociety.org.uk or come along to Crosthwaite Parish Room (next to Keswick Co-op) at 6.50 pm on Tuesdays during the season.